I'm not gonna lie: It's a lot like meeting Oz in his Emerald City. 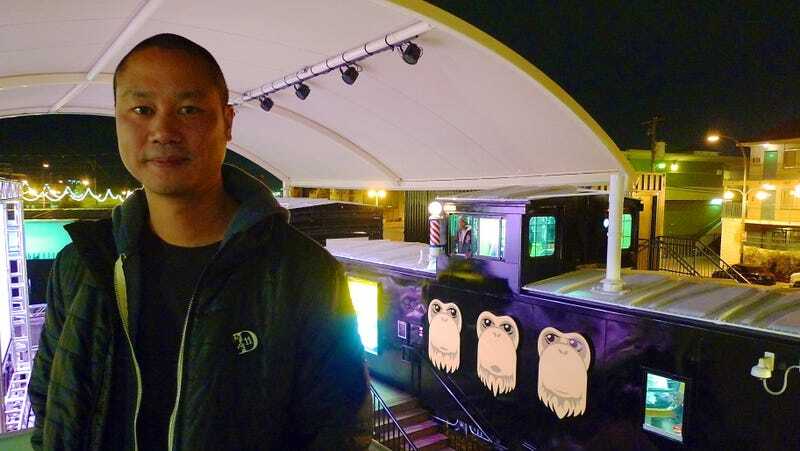 Mostly because no one associated with him would set up a formal time for me to meet with Tony Hsieh, CEO of Zappos and the financial and philosophical force behind the Downtown Project, the $350 million urban revitalization program transforming downtown Las Vegas. I was encouraged instead simply to "find him" at one of the events happening the week I was in town. Rather than be annoyed, I actually liked the idea. If I could find him, it would prove he had achieved that serendipity factor the initiative had strived to create in the downtown blocks: We could have a "collision," one of the three C's in the Downtown Project's mission. Someone tipped me that he was so accessible and friendly you could often find him in the evening buying shots for people at the Gold Spike, the former casino the Downtown Project that had been turned into a bar and co-working space. I hung out there one night to no avail. When I wrangled an invite to a VegasTechFund networking event happening at Cube Space, a bar in the Container Park, I thought for sure he would be there, and scanned the crowd looking for an important-looking billionaire. Instead, he walked right behind me: low-key, unassuming, and looking about a decade younger than his age (40) in a quilted nylon jacket, a hoodie, and a t-shirt. I stuck out my hand and introduced myself. He was just as nice as everyone said. First thing I had to know: Does he really live in the "Tony Hsieh apartment" that I had been taken to during the Downtown Project tour? "Yes, I do," he says, smiling. "I was probably sleeping when you came by." Before I could ask another question, though, Hsieh began interviewing me about my own experience there: "What have you seen that you liked the most?" I admit to him that I've been impressed by the food, specifically the variety and quality of restaurants, and he immediately starts recommending more places for me to eat. Then he moves into other diversions. Did I check out their about-to-open Inspire Theater, he wanted to know. Had I been to the Gold Spike? Did I go in the two railroad cars behind him that they bought on Craigslist for $5000 and turned into a barber shop for L.A.-based Bolt Barbers? "One of the coolest things about living downtown now is that the Downtown Project is about 300 projects going on simultaneously. We're at the point where, every week, there's a grand opening of something—so it's just a great place to be," he says. Now those events are even attracting people outside of downtown residents. "What's funny is that we're just focused on locals. But, the other night here in the park, we had 6000 people in there! At one point they had to stop letting people in." Hsieh wrote a book about happiness, and, not surprisingly, he wants to bring that feeling to his development plans. "One of our principles for the Downtown Project is that we want there to be an ongoing sense of discovery, so you'll go back to the same spot but find something new." The bar Commonwealth has a disguised speakeasy, for example. Inspire has secret rooms and passageways. The hydrant at the dog park has a hidden lever that showers the sidewalk with water. "If you come back in six months, you'll see a motel we're converting to boutique shops, and this is what is going in the courtyard," he says. On his phone, he shows me the Big Rig Jig, a 50-foot-tall, 25-ton art car by L.A.-based Mike Ross made from two tanker trucks that's been to Burning Man and Coachella. He has essentially embedded urban Easter eggs throughout the neighborhood, all in the name of discovery. "We're just getting people to walk one more block, and then one more block." That's when my urbanist radar goes off. Wow, he gets it, I think, in a way that very few people get it. I remember back to an early fact about him I was impressed with: He closed the pedestrian bridge from the parking garage to the Zappos office, so all employees, no matter what transit mode they use to get to work, have to walk out on the street and enter through the same central plaza. He understands that people exploring the street are the most important part of building a neighborhood. He goes on, with a smart take on branding the neighborhood—something that most revitalized cities really need help with. "Everything we want to do, we want to be first, unique, or best," he says. "Story-worthy, driven by passion, and then it needs to be sustainable." Downtown Vegas needs to be known for something specific, he says, and Hsieh thinks that thing should be fire. "There's no city that quote-unquote owns the concept of fire, and I think we have the opportunity to do that downtown in Vegas," he says. There happens to be an example several yards away from us, a prototype from a San Francisco company called LiveSpark which has invented a "fire pixel" with a controllable flame: "Imagine a smaller version of the Bellagio fountains, with fire." That sounds dangerous, I say. He doesn't react to that. When I come back to Vegas, he says instead, I'll see that technology atop new street lamps. The surreal conversation we're having about installing giant, programmable trick birthday candles with open flames as street lighting is about to get weirder. Almost on cue, flames begin spewing from the giant praying mantis at the Container Park (a sculpture which has also been to Burning Man). "Go to the front and tell the guy said you talked to me, he'll probably let you go up there and press the button," Hsieh tells me. I could probably just go anywhere and say "Tony sent me" and people will let me do stuff, right? He laughs. "Probably." Earlier that day, I had still been frustrated with the Container Park: It was too upscale, somewhat sterilized, not a true public space. But at night—particularly this night—it's pretty darn magical. It's obvious that there are people here from all different backgrounds, some lining up to trade their email address for a pair of glowing neon sunglasses. Toddlers dance on a large artificial lawn to a ukelele band playing onstage. But then every few moments the scene is punctuated by the thundering blasts of a praying mantis emitting fireballs. Each time, the explosion is large enough to make people around me yelp. I touch my hair and feel the dissipating heat from above. I don't want to press the button. There was still a lot about the entire initiative I had to resolve in my head. After pausing to make an impulse buy (two pairs of leggings), I had to go meet some friends for dinner. But there was one more thing I needed to do. I had promised Hsieh I would go down the slide. "It's actually part of the rite of passage," Hsieh had said, when telling me about the giant spiral slide in the center of the Container Park. "It's pretty scary, half of the adults scream. Are you gonna go?" I said yes. "Like, today?" Yes, I laughed, I'll do it right now. "Okay, good," Hsieh said, pointing to my phone that had just recorded the conversation. "We got it on tape." I climb four stories of stairs through the convincing plastic stump of the treehouse, ducking through tunnels, passing people of all ages making their way up. But at the top, I'm alone on the platform. There are incredible views of downtown in all directions. I pause for a minute to imagine choreographed gas lamps lining the sidewalks, wondering how he's going to get what are essentially dozens of small fires approved by the city council. It's probably the best non-water slide I've ever been on in my life. I scream the entire way down.